The idea of "rolling coal" has been around for a little while, but now it has become a full-fledged anti-environment protest. Essentially, diesel truck owners with a strong desire to preserve their right to be as thick-headed and inconsiderate as possible modify their trucks to increase fuel intake. Excess fuel inhibits combustion enough that any fuel which isn't combusting is exhausted as soot. These mods are expensive, so a person has to really commit to being this hateful. According to an article in HuffPo, one Wisconsin smoke stack kit seller says that a lot of people who purchase these types of kits to roll coal are very anti-Obama because they believe: 1) He is for the environment; 2) If he is for something, it must be bad so they're against that too. Flawless logic being put to use here. 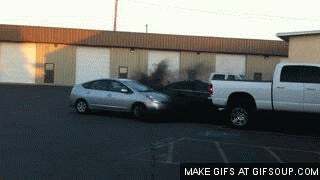 That Prius totally deserves it.